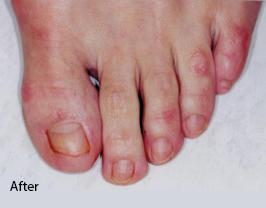 Onychomycosis, more commonly known as nail fungus, is an infection that attacks both fingernails and toenails. Fungal infection can damage nails in a variety of ways. Extreme thickening or crumbling of the nail, raised appearance and discoloration could be all symptoms of fungal infections of the nail. 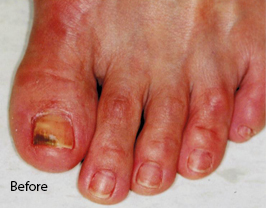 Nail fungus, mostly seen in toenails, can cause needless physical and emotional discomfort. Fortunately, help is available at the Dermatology & Laser Surgery Center. Through a combination of the latest innovations in laser technology, oral and topical medications, Dr. Goulko can effectively treat your fungal infection of the nail. Laser treatment for this problem is usually well-tolerated by patients, and experience has shown it to be safe and effective. Eradicating toenail fungus, although it may require few procedures, usually requires little or no “down time” for recovery. Please call today for a consultation to discuss how to begin a personalized treatment regimen.